My long run on Sunday was such a killer. I set up an aid station in my car and made a stop every four miles to down some Gatorade and grab a Gu. During my stop at mile eight I sat down for a second and did NOT want to get back up. At this point in training running eight miles isn’t a big deal. My legs weren’t tired, but I think I was pretty dehydrated. I shouldn’t have gone out running when the sun was still so high. I thought 6pm would be late enough but I was covered in salt by the midway point of my 14-miler. Thankfully I had brought three bottles of Gatorade with me. I thought that might be excessive, but I ended up drinking almost all three bottles completely. When I stopped at mile 8 I downed an entire bottle in about 30 seconds. That Gatorade was like liquid gold. It literally brought me back to life! THANK YOU GATORADE, I LOVE YOU! Overall it was a good week. I hit the paces and mileage that I needed to. That being said, I am having some doubts about being able to run 26.2 miles at 13:42 pace. I know the heat and humidity in Chicago this October is likely going to be MUCH more favorable than what I’m dealing with now… but it’s still hard to believe that I’ll be able to cover the entire course at my goal race pace. I just don’t see how it’s going to happen. I’m still not ready to make an official adjustment to my A-goal but it’s weighing at the back of my mind. On a more optimistic front, I’m been really happy with how my lifting has come along this training cycle. 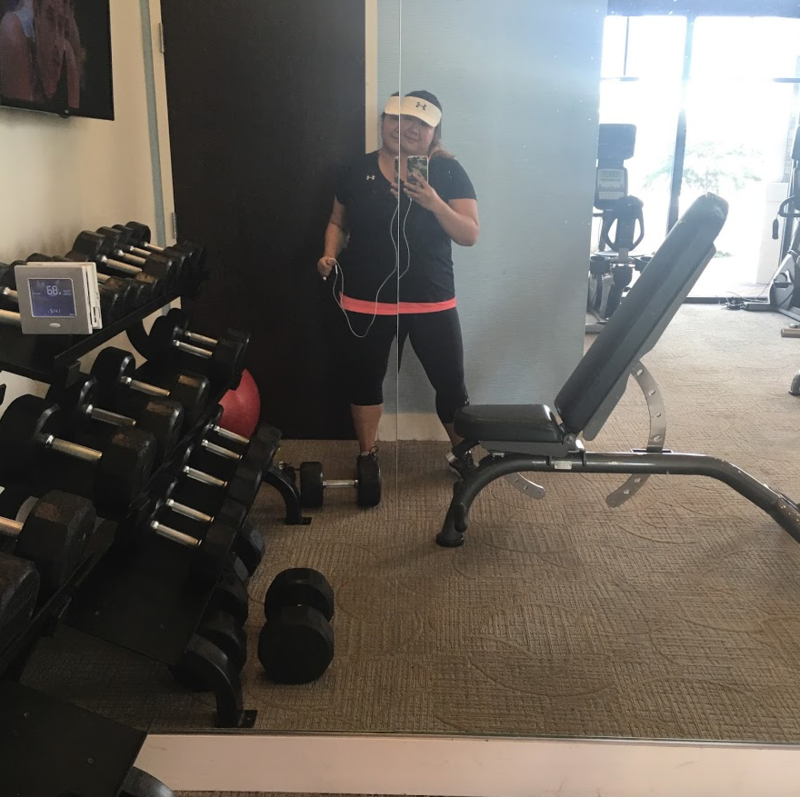 I haven’t really made any gains but I’m glad that I’ve stuck with my routine – even if I did bring it down to only one day a week. I’m pretty sure every other year I’ve completely abandoned weightlifting when I’m focused on a big race. I hope my continued dedication to lifting will help me feel less tired during the marathon. I remember in Portland around mile 18 my back started to really bother me. I think my posture had probably gotten pretty bad by that point. 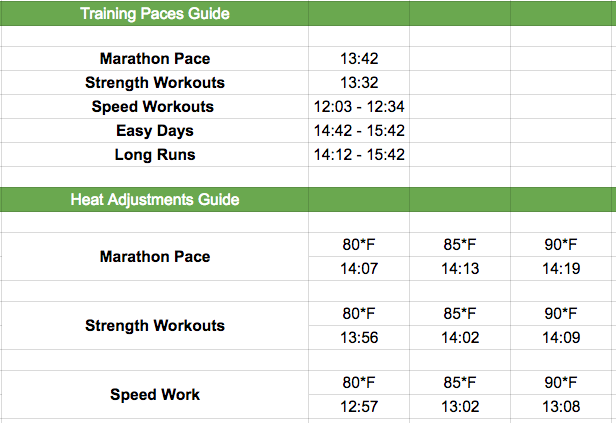 Hopefully my upper body and core are feeling strong at mile 18 this year! I’m hoping for another strong week, although I’m not entirely sure what to do about my long run this weekend. I won’t be able to do it on Sunday so I need to either move it to Friday of this week or Monday of next week. I’ll be flying both Friday and Monday. If I run it on Friday I will have to get up super early to get it done before my flight. Then I’ll probably be tired and cranky the first day of my NYC trip. If I wait until Monday I’ll be able to do it in the afternoon when Adam and I get home. I should be well rested on Monday, but I’ll then be doing my long run on my normal rest day which could mess up the rest of next week. What do you think I should do? Move the long run to Friday or Monday? Previous Post Why Monday is My Favorite Day! I vote for getting it out of the way on Friday! Then you can spend the rest of the weekend not worrying about it. But that’s coming from someone who likes morning running! I think Friday would be the be better choice but I don’t run well when I’m really tired and would probably go for Monday. I agree with Friday–Then you don’t have to waste energy worrying about it all weekend! Plus, when you get home on Monday you can relax. The humidity has been unbearable this summer…Fall can’t come soon enough! I’m voting for Friday. Then you can relax on Monday when you return. Don’t stress about pacing and stuff right now, stick to the process. You got this!! If it were me, I’d move it to Friday. I’m a morning person anyways, and I just know I would not have the motivation, or interest, in running it after I got home! I have to move my tempo run on Sunday to the evening that same day (from my normal morning run), and I’m already thinking it will not be pretty!! Oh, and think of the snacks/drinks/desserts you will be able to enjoy on Friday practically guilt free! 🙂 Good luck with whatever you decide. Woohoo to a NYC trip!! That sounds fun! I saw Secret Life of Pets last night and wondered what it would be like to live in the big city. The pets all looked like they loved it. haha! I hope you have fun in the NY. DO not abandon that A goal. You can do it if the weather is favorable. 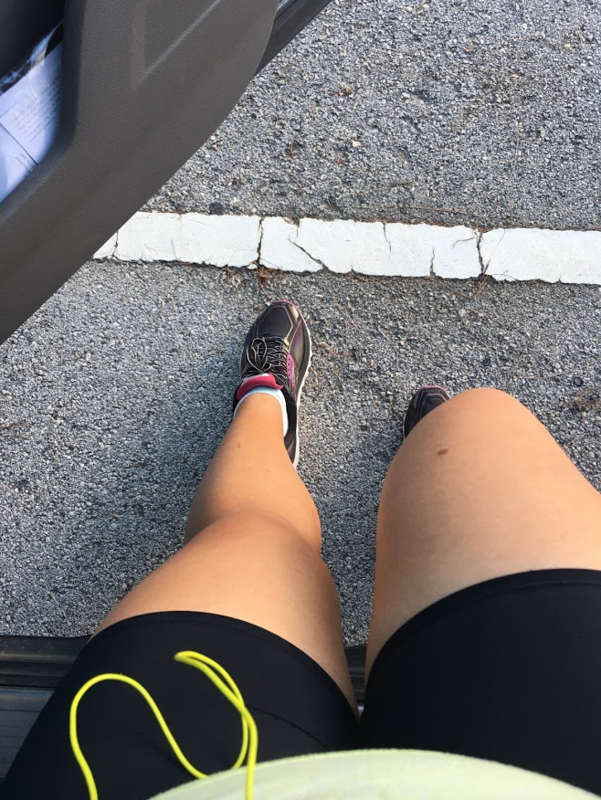 I know you can 🙂 All this heat training is building endurance, I feel the same way when I see my pace and I know how I feel right now, but that happened last year too. Well I know *I* would do it Friday because there is NO WAY I would be able to travel home and then run. Also, you know I am a morning runner. But you are not me. You are Kristina. And I have a feeling Kristina is more likely to do it on Monday! Starting at 6pm to do 14 miles takes a LOT of determination, girl, so good work! The heat and humidity has definitely been awful this year. I have a post waiting to go up about how this July has been the hottest on record. I think when it comes to the marathon, we can do our best and train our best and part of it is still going to be a crapshoot. But trust your training! There’s a method and a science behind it, right?! I think lifting consistently will not only help your back during the race, but it will also help you be faster! I find I’m faster when my upper body is strong. Weird.